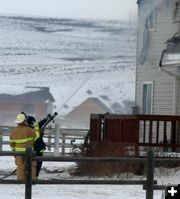 Pinedale House Fire Firefighters from four volunteer fire departments responded to the blaze in Pinedale. Fire in attic The fire started in the attic of the home. 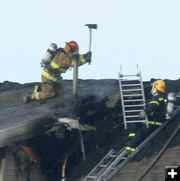 Chopping into the roof Daniel firefighter James Bond, left, chops into the roof of the home while Wil Gay (Boulder VFD) helps with ladders on the roof. Temperatures at the time were below freezing, with strong frigid winds bringing the wind chill well below zero. Firefighters from Pinedale, Daniel, Boulder and Kendall Valley Volunteer Fire Departments responded to a house fire at 6 South Fork Trail in south Pinedale on Thursday morning. 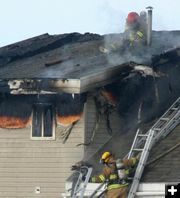 The fire significantly damaged the upper floor of the two-story home. 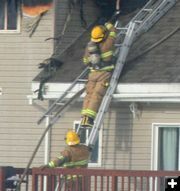 The fire didn’t reach to the first floor, however a large part of the contents were destroyed by water and smoke. The homeowners got out safely, and the family pets were also rescued. “There is very extensive damage to the upstairs on the inside,” said T.J. Hunt, Sublette County Fire Warden. 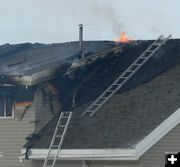 The cause of the fire was determined to be accidental as the result of the homeowner attempting to thaw frozen pipes in the attic. “We were lucky the fire went out pretty quickly for the amount of wind we had,” said Pinedale Fire Chief Alvin Mitchell. He noted that Sublette County EMS and Sheriff’s Office also responded to the blaze. Adding to the seriousness of the fire, this subdivision is just outside of the Pinedale town limits and does not have a fire hydrant system to supply water for fire emergencies. This resulted in the Sheriff’s Office having to put out a call to the neighboring fire departments to bring in as much water as possible in tanker trucks for the firefighting efforts. 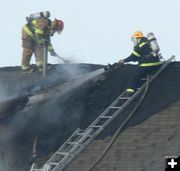 Firefighters were able to knock down most of the fire inside the home, but were unable to reach part of the blaze in the attic from the inside. 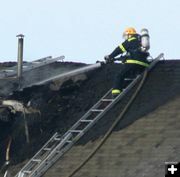 They had to bring ladders and climb onto the steep roof of the two-story building from the outside in order to cut through the roof and douse the remaining portions that were still burning. “It was pretty slick,” Mitchell said. Temperatures were in the low teens and strong, gusty winds brought the wind chill factor to as low as -42F, according to the National Weather Service. Mitchell explained this fire was a good example of the danger the volunteer firefighters are placed in when a firefighting situation involves more than one story. He is lobbying strongly to get a 900,000 gallon aerial platform truck for the department. The truck would allow firefighters to work from a bucket and have a tether line while they fight fires on upper stories. “Last time we checked it was about $900,000. It’s probably about a million now,” he said. The Sublette County Commissioners have already committed to pay for one third of the cost. Mitchell is trying to secure another third from the towns and hopes to get contributions from industry and other sources for the other third. Two weekends ago, thirteen Sublette County firefighters completed the training to become Pro Board Certified at the Mid-Winter Fire School held at the Wyoming Fire Academy in Riverton, Wyoming. The course is an accreditation program that certifies firefighters at a national level. “The training we had in Riverton was put to use really well by our firefighters,” Mitchell said. Photos by Clint Gilchrist, Pinedale Online! On the roof Daniel firefighter James Bond stands on the second story roof and sprays water on hot spots. Spraying Water Boulder fireman Wil Gay sprays water on the home while talking with Sublette County Fire Warden T.J. Hunt (Daniel VFD) about their strategy to attack the blaze. Getting hoses up (L to R) Lars Anderson and Greg Anderson (Daniel VFD), Mark Reinwald (Pinedale VFD). Curt Esterholt (Pinedale VFD) is on the ladder. More help arrives Firefighters from Pinedale, Daniel, Boulder and Kendall Valley Volunteer Fire Departments responded to the blaze. Note the wind blowing snow across the road in front of the truck. 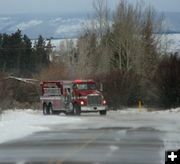 Strong winds and cold temperatures made for frigid conditions for firefighters battling the blaze. Hosing the roof James Bond (L) and Wil Gay (R) spray water on the roof and into hot spots in the attic. On the ladder Curt Esterholt (on ladder) and Mark Reinwald, Pinedale firefighters, help with getting the hoses to the roof. House fire The fire caused considerable damage to the upstairs of the home. 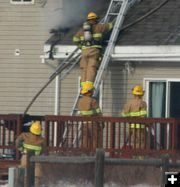 The homeowners and family pets were unharmed. Wil Gay Boulder firefighter Boulder firefighter Wil Gay sprays water onto the roof. Gay is also a Pinedale EMT. Working on the roof James Bond (Daniel VFD) works on the roof on the second story while Curt Esterholt (Pinedale VFD) helps with the hose from the ladder.